The Topics constitutes Aristotle's treatise on the art of dialectic—the invention and discovery of arguments in which the propositions rest upon commonly held opinions or endoxa (ἔνδοξα in Greek). Topoi (τόποι) are "places" from which such arguments can be discovered or invented. 1 What is a "topic"? In his treatise on the Topics, Aristotle does not explicitly define a topos, though it is "at least primarily a strategy for argument not infrequently justified or explained by a principle." He characterises it in the Rhetoric thus: "I call the same thing element and topos; for an element or a topos is a heading under which many enthymemes fall." By element, he means a general form under which enthymemes of the same type can be included. Thus, the topos is a general argument source, from which the individual arguments are instances and is a sort of template from which many individual arguments can be constructed. The word τόπος (tópos, literally "place, location") is also related to the ancient memory method of "loci", by which things to be remembered are recollected by mentally connecting them with successive real or imagined places. Though the Topics, as a whole, does not deal directly with the "forms of syllogism", clearly Aristotle contemplates the use of topics as places from which dialectical syllogisms (i.e. arguments from the commonly held ἔνδοξα, éndoxa) may be derived. This is evidenced by the fact that the introduction to the Topics contains and relies upon his definition of reasoning (συλλογισμός, syllogismós): a verbal expression (λόγος, lógos) in which, certain things having been laid down, other things necessarily follow from these.. Dialectical reasoning is thereafter divided by Aristotle into inductive and deductive parts. The endoxa themselves are sometimes, but not always, set out in a propositional form, i.e. an express major or minor proposition, from which the complete syllogism may be constructed. Often, such propositional construction is left as a task to the practitioner of the dialectic art; in these instances Aristotle gives only the general strategy for argument, leaving the "provision of propositions" to the ingenuity of the disputant. Methods and rationale for attaining each of these ends are briefly illustrated and explained. Book II is devoted to an explication of topics relating to arguments where an "accident" (i.e. non-essential attribute, or an attribute that may or may not belong) is predicated of a subject. Book III concerns commonplaces from which things can be discussed with respect to whether they are "better" or "worse". Book IV deals with "genus"—how it is discovered and what are the sources of argument for and against attribution of a genus. Book V discusses the base of "property"—that which is attributable only to a particular subject and is not an essential attribute. Property is subdivided into essential and permanent, versus relative and temporary. Book VI describes "definition" and the numerous means that may be used to attack and defend a definition. Book VII is a short recapitulation of "definition" and "sameness", and compares the various difficulties involved in forming arguments, both pro and con, about the other bases of dialectical disputation. Book VIII (the final book) is a lengthy survey containing suggestions, hints, and some tricks about the technique of organizing and delivering one or the other side of verbal disputation. The Sophistical Refutations is viewed by some as an appendix to the Topics, inasmuch as its final section appears to form an epilogue to both treatises. ^ These "commonly held opinions" are not merely popular notions held by the man-on-the-street about any and all subjects; rather, the dialectical ενδοξα are commonplaces of reason upon which those who conscientiously dispute (all men, most men, the wise, most of the wise, or the best known among the wise) agree in principle -- i.e. that which is "enshrined" (to borrow a cognate religious term) in opinion or belief among those who engage in disputation. ^ "Dialectic and Aristotle's Topics". Stump, Eleonore. Boethius's De topicis differentiis. Cornell University Press. Ithaca and London, 1978. p. 170. 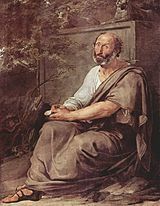 ^ Aristotle refers to rhetoric as "the counterpart to dialectic" in the introduction to his Rhetoric (1354a et seq), noting that both alike are arts of persuasion. Both deal, not with a specific genus or subject, but with the broadly applicable principles of things that come within the ken of all people. Rhetoric is distinguished from dialectic in that the former employs not only syllogism (i.e. enthymeme), but additionally makes use of the character of the speaker and the emotions of the audience to perform its persuasive task. ^ These are discussed elsewhere, as in the Prior Analytics. ^ For Aristotle, "demonstrative" arguments (ἀποδείξεις, apodeíxeis) are those that comprise science, and analyze a particular genus or subject matter by means of propositions or axioms that admit of no further syllogistic proof. "Contentious" arguments are those that proceed from propositions that only seem to be ἔνδοξα éndoxa, or that only seem to reason from such propositions. "Pseudo-scientific" arguments are those based upon faulty models—such as a geometer's argument from a falsely drawn diagram. ^ The Topics contemplates an adversarial system of question and answer, in which one party attempts to elicit from another, through yes-or-no questions, the conclusion he wishes to prove. ^ E.g. Forster, E. S. in Aristotle. Topica. Loeb Classical Library Cambridge: Harvard University Press, 1989. p. 265. Bekker, Immanuel. Corpus Aristotelicum. Berlin 1831. Oxford 1837. This is probably the most traditionally accepted critical edition of the works of Aristotle (Greek). Oxford Classical Text edition by W. D. Ross, 1958. Aristotle. Topica. Translated by E. S. Forster. Loeb Classical Library. Cambridge: Harvard University Press, 1989. With facing Greek and English pages. Collection Budé edition (includes French translation) of Books 1–4 by Jacques Brunschwig, 1967 (2nd ed., 2009). Collection Budé edition (includes French translation) of Books 5–8 by Jacques Brunschwig, 2007). Robin Smith (ed.). Aristotle's Topic Book I and VIII Translation and commentary. Oxford: Clarendon Press, 1997. G. E. L. Owen (ed). Aristotle on Dialectic: the Topics. Proceedings of the Third Symposium Aristotelicum. Oxford, 1963). Oxford: Clarendon Press 1968. Paul Slomkowski. Aristotle's Topics. Leiden: Brill 1997. Sara Rubinelli. Ars Topica: the Classical Technique of Constructing Arguments from Aristotle to Cicero. Springer 2009.